– You can enter five messages and have them scroll across the screen individually or sequentially. 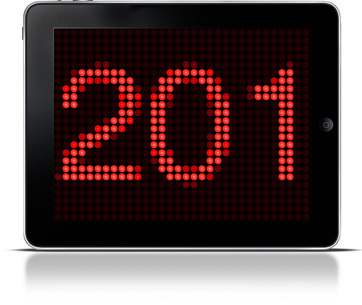 – You can display today’s date, current time, Twitter’s tweets and iPod-playing music information. – You can adjust the scrolling speed from very slowly to very quickly. 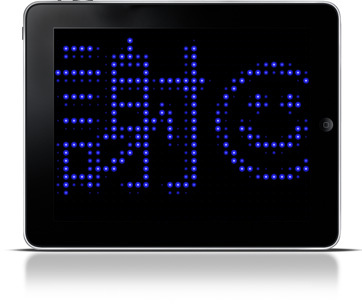 – You can set the blink display, Upside down display, Mirror display and Sleep disabled mode. 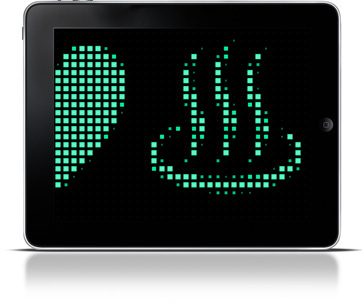 – You can select from 6 shapes and any color for the LED display. – You can set the program to require a double tap to open the editor in order to prevent it from accidentally opening. 배너는 임의의 메세지를 표시하는 LED 매트릭스풍의 디스플레이며, 다음과 같은 특징을 갖고 있습니다. ・최대 5종류의 메세지가 입력 가능하며, 입력한 메세지를 전환하거나 연속으로 스크롤 표시를 할 수 있습니다. ・오늘의 날짜 혹은 현재 시간, 트위터의 트위트, 현재 재생중인 노래 제목 등도 표시 가능합니다. ・느릿느릿한 속도에서 매우 빠른 속도까지 메세지의 스크롤 속도를 설정할 수 있습니다. ・점멸 표시, 상하 반전 표시, 미러 표시 등의 설정이 가능하며, 아이폰의 잠자기 기능을 취소하는 설정도 가능합니다. ・6종류의 형태와 임의의 색을 조합하여, LED 디스플레이의 모양을 설정할 수 있습니다. ・오동작을 방지하기 위해, 더블 탭을 통한 편집화면 열기 설정이 가능합니다. Will you please make this support composite out?? Please. I’m a Vj and use this app all the time but I wanna be able to plug it right in ot component. Composite. Thanks! Hi Cj stewart, You can use a composite out (and VGA, HDMI, etc.) when you use iPad 2. But it’s not supported for iPad 1. Sorry for that. 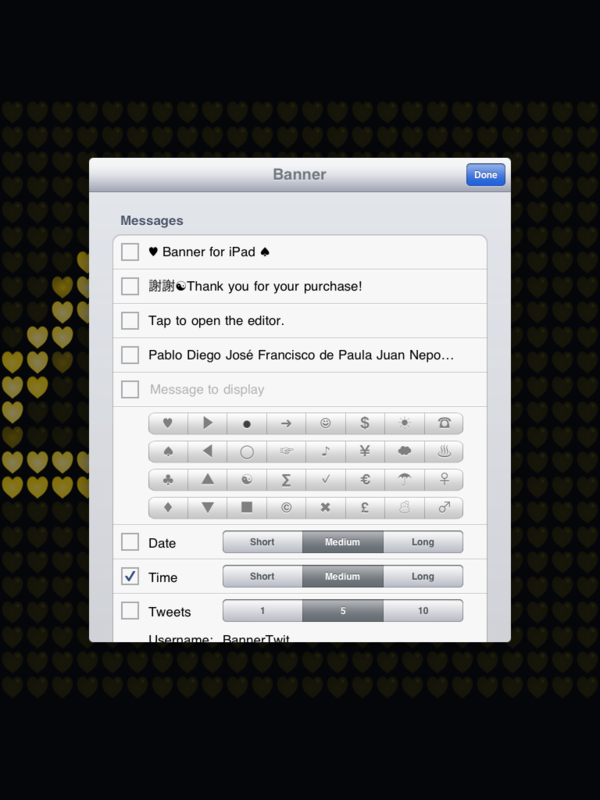 Banner for ipad: wanted to display time only and I get the same welcome and thankyou message that it came with when purchased. Re- installed twice with no results. Hi robert, If you want to display the current time only, turn “Time” checkbox on and turn the others off. I can do that with no problem with my iPad 2 and iOS 4.3.5. Thank you. Thanks for the GREAT support!!! works Perfectly. Super App. Hello Akamatsu san, I just want to ask, can you loop the messages? I want to just play the banner, put it on my business counter, and go to work. But i cant do that if it doesnt loop, and somebody needs to restart it everytime the messages finished playing. Because everytime it finishes, it closes and go right to ipad’s main menu. Hi Dedy, Banner loops any messages endlessly. No problem. That how it supposed to do? Then I think there’s a bug here. Because everytime the message finished, banner on my ipad closes the program automatically and return to ipad’s main menu. Just found the source of the crash, it’s the time option. Everytime i checked ‘time’ and the banner reach that point, it just crashes and shut off. Hi Dedy, I can’t reproduce an error/crash with the “Time” display. The app shows the current time repeatedly. 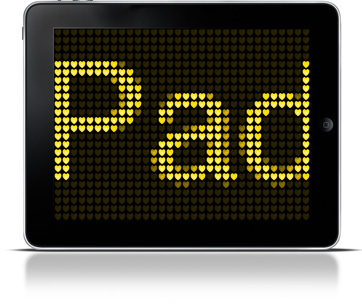 Let me know your environment, iPad 1 or 2, iOS version, language, locale and so on.